SCUBA diving in Tenerife is big business! Look it up on the internet and you'll find loads of sites about it. This is because Tenerife has crystal clear waters, a benign climate, rich and varied marine life, plus many sunken wrecks and caves to explore. Many dive shops and schools exist on the island and I'll detail these below. 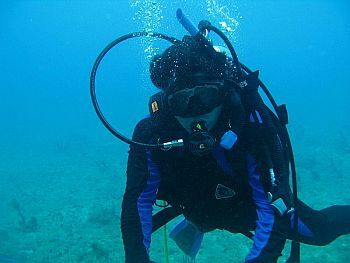 Each diving centre has its own set of dive sites, which are available according to the ability of the individual diver. All diving centres usually have schools, where the novice diver can learn the ropes, sufficient to undertake a not too demanding dive. There literally is something for everyone! "We wished we had found you before!" 5 Star PADI Diving Centre in Tenerife. All PADI courses available and great prices on Dive Packages and equipment. The best Island in the Canaries with great weather and even better diving. Situated in the Compostela Beach resort, between Los Cristianos and Las Americas, you'll find the Wreck n' Reef diving centre and school. Their instructors are all members of PADI (the Professional Association of Diving Instructors) and conduct a selection of dives off the south coast of the island, of varying degrees of difficulty. For novice divers, Wreck n' Reef provides instruction for beginners. They have a couple of easy dive sites just off Las Vistas beach. Just to make you feel at ease, you may meet the turtle who lives there, christened Gilbert! Diving instruction ranges up to the advanced level, where students can pass the examination for PADI Open Water Diver, receiving a certificate to that effect. There are three aspects to the advanced dives on offer. You can explore the many wrecks off the Tenerife shore. Lying at between 20 and 30 metres depth, you can see old merchant vessels, plus more recent schooners. The offshore reef houses a plethora of marine life and, lying only some 12 metres deep, offer much opportunity for taking photos. The ocean bed can drop off abruptly to great depths and there is an abundance of caves to be seen. The underwater landscape, with a 50 metre range of visability, is breathtaking. Wreck n' Reef offers a selection of diving courses, ranging in price from 220 to 295 euros. 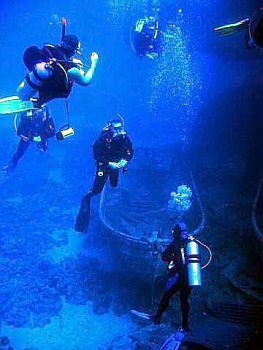 For experienced, certified divers, there is the popular "Three Dive Course", for just 99 euros. This consists of one shore dive, one boat dive and one jeep safari dive, spread over a day and a half. For more information on all this, refer to the website. I have been contacted by someone who has recently been holidaying in Tenerife and went to Compostela Beach to look for Wreck n' Reef. He discovered that their centre was no longer there. It also appears now that their website has disappeared. It may be safe to assume that Wreck n' Reef is no longer trading.